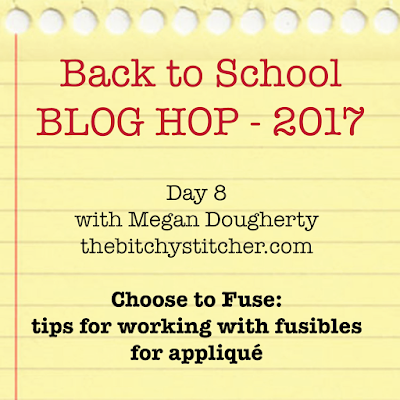 Welcome to the Back-To-School Blog Hop! I chose to talk about fusible products for appliqué since that is predominately how I create these days, and I want to share with you some things I have learned that helped set me on my current fusible appliqué path. (If you’d like to see some of my work, head over to the My Quilts gallery page, where the first eight pieces you’ll see all use fusible appliqué.) Maybe you’ll be infused with a new-found enfusiasm for fusing! Part of what makes fusible products so confusing is that there are so many different ones and everybody has an opinion about which one is the best. In reality, there is no one best fusible product. They all have slight differences, and what works best for you will depend on your particular preferences. Since most of my appliqué pieces are meant to hang on a wall, I am not as concerned about the feel of the fabric after fusing as I am about the ease of transferring and cutting out my design. 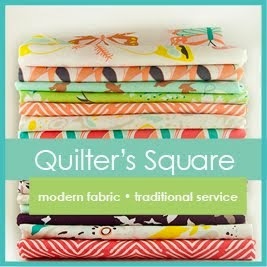 Others want the softest fusible possible for use in quilts that need to be comfy and not stiff. But how do you know what you are going to get when you see the profusion of fusible products out there? 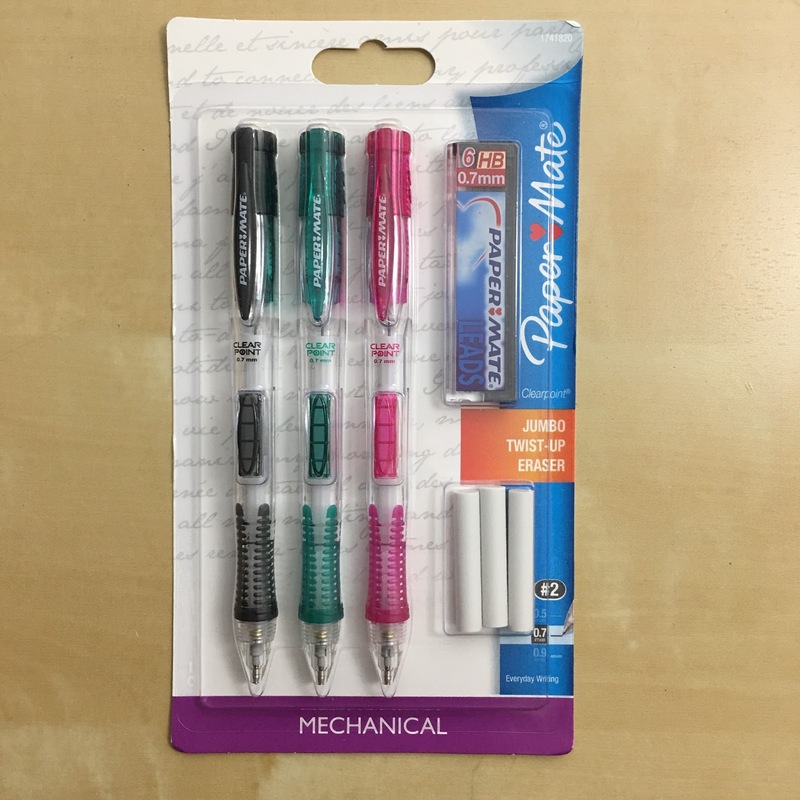 Double paper-backed include the Steam-a-Seam 2 products (regular and Lite). With these, you draw or trace on the gridded paper, then remove the other paper, revealing fusible that has a sticky surface. Rather than ironing down at this point, you use pressure to stick the fusible and backing to the wrong side of the fabric. You then cut out your shape, remove the backing, and iron to the background fabric. Many people love these for the ability to make things stick together before the final ironing. Personally, I dislike it because it doesn’t stick well enough when cutting and two papers to trace through gets bulky. Free-love (or non-paper-backed) fusibles are rarer and the most commonly used and known is Mistyfuse. With no backing, you have to have some other way of getting your design transferred and one way I have seen is by using parchment paper. (See below for a few details on how to use this.) Mistyfuse is by far the softest, both before and after washing, of every fusible product I have used, so if that is important to you this will give you the best results. Although you can often trace designs onto fusible backing without illuminating it from behind, light will help a lot and your poor tired eyes will eventually thank you. The cheapest and most easily obtainable light box is of course a nice big window. You can tape your design to the window, hold your fusible on top of it (fusible backings tend to not like tape very much) and trace your design. I can tell you from experience that unless you have very good upper body strength, this gets tiring and even painful after a while. The newest models of light boxes are actually thin tablets with an LED light inside and can be adjusted for brightness. You can use these at a table or even on your lap as they don't get hot. 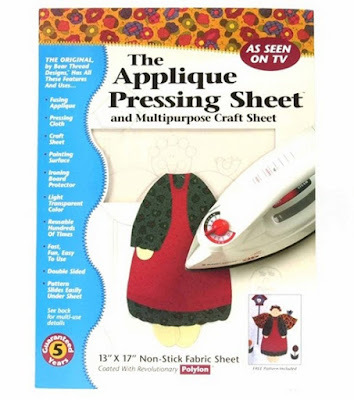 With the exception of Pellon EZ Steam and Mistyfuse, you will be tracing your designs onto the paper backing of a fusible and these papers are treated so that they will easily peel away after ironing. This means they don’t take ink very well—ink tends to just bead up and smear away. Pencil works beautifully, however a standard number two pencil will lose its sharpness pretty quickly and you’ll find your line getting thicker and thicker as you draw. A mechanical pencil keeps a nice thin line no matter how big your piece and you don’t have to stop to sharpen again and again. In the case of a product like Mistyfuse, which has no paper backing, you may need to draw your design onto something that can be peeled away later, and parchment paper is perfect for this. Parchment paper is treated with silicone, which is why food doesn’t stick to it. If you place your Mistyfuse on the wrong side of your fabric, lay a piece of parchment over the Mistyfuse and iron, the Mistyfuse will adhere to the fabric and the parchment will stick to the Mistyfuse until (after cooling) you are ready to peel it off. Parchment paper is not the same as wax paper or butcher paper or freezer paper—only parchment paper will work in this application. As with so many things, this is subjective, but it’s worth finding the one that works best for you. Appliqué shapes that are somewhat detailed may be easier to cut out with smaller scissors rather than your big ol’ fabric shears, but go too small and your hands will cramp. The small Fiskars on the right are what I use most often because the blades are thin, pointy, and sharp, but they do make my hands hurt after a while. The spring-loaded Fiskars on the left are much easier on my hands, but though the blades are relatively small, they are not as thin and pointy as the others. The Tim Holtz blades in the center have big handle grips, very pointy blades, and are slightly serrated, which some people like (I prefer a smooth blade). I find that the paper backings on some fusibles peel away easier a day or two after ironing and cutting. If I need to peel it off sooner, or if I just have one that’s being stubborn, I score the paper with the point of a pin. I can then peel away from the scoring line rather than the edge of the appliqué piece (which also saves my edge from fraying). 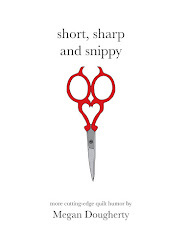 Straight pins are much better for this than the point of a pair of scissors or a seam ripper, which could tear your fabric. 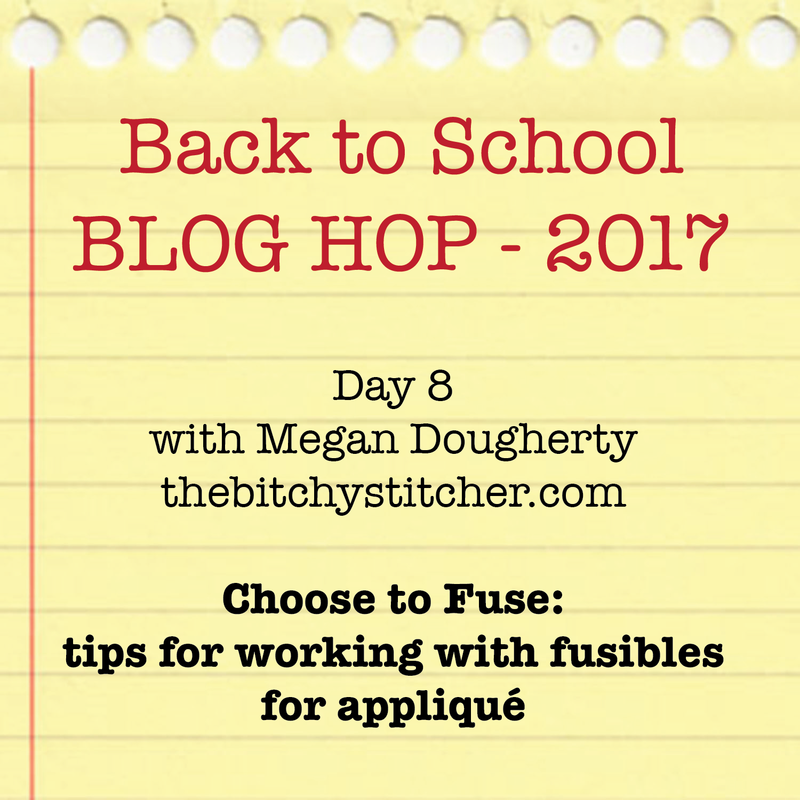 Day 8 – August 22 – Megan Dougherty: Choose to Fuse: tips for working with fusibles for appliqué – www.thebitchystitcher.com <—- you are here!